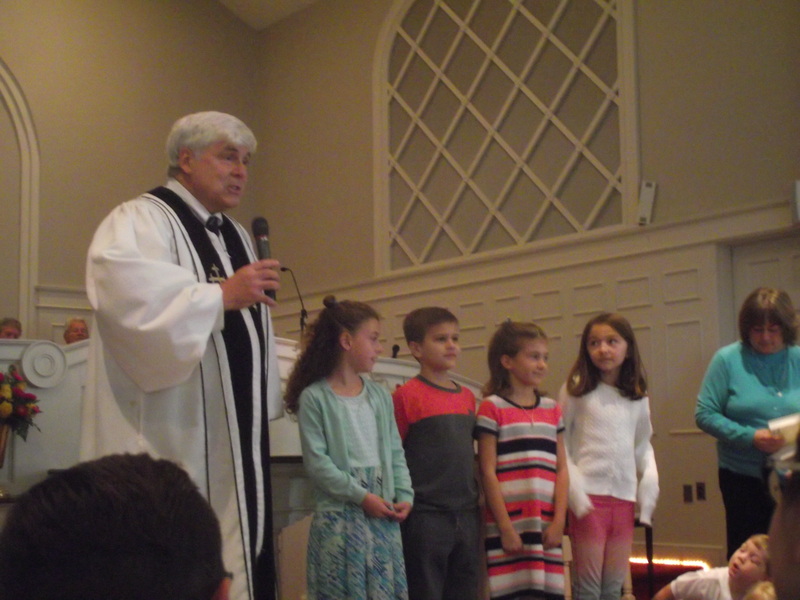 Ever since her 1942 origin as a community-wide area Sunday School, the Greenwood Community Church, Presbyterian has had a very strong, consistently well-attended, and ably-led Christian Education program for all ages from toddler through adult. Twenty-two volunteer teachers make up the Sunday School staff under the capable leadership of co-superintendents Joann Rudolph and Kristine Swanson. 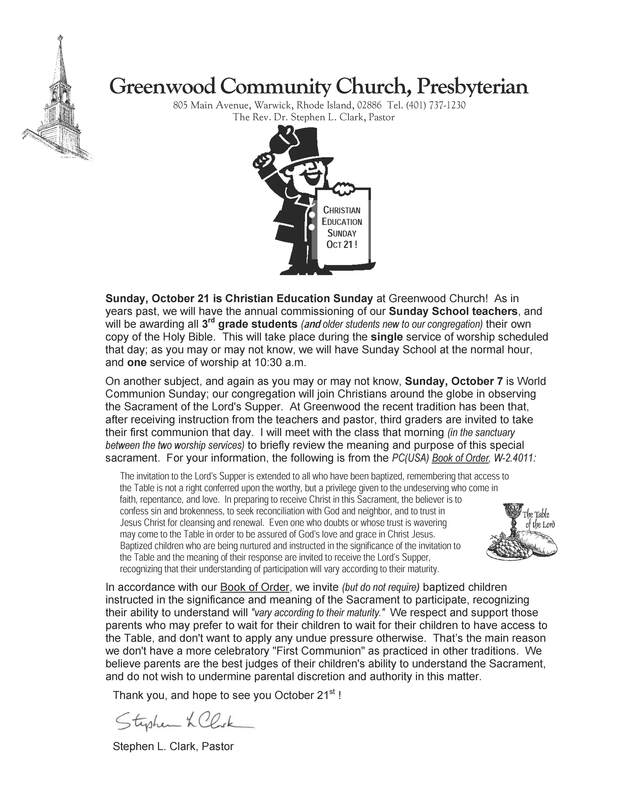 Sunday Church School runs from 9:00 A.M. through 10:15 A.M. from September through May. Additionally, we offer a Time With the Children sermonette with the pastor and a Children’s Church session during the 10:30 Service of Worship (9:30 in the summer months). An active and thriving youth fellowship is offered older youth of junior and senior high age and King’s Kids offers a time of weekly fellowship for children in grades two through six. In addition to providing well-rounded, age-appropriate, Bible-based and Christ-centered curriculum for all ages, the Sunday School helps support several mission and humanitarian programs. Supported missions include the Providence Rescue Mission, Heifer Project International, World Relief, the Mitten Tree, Thanksgiving Food Collection, and One Great Hour of Sharing. A Confirmation Class (approximate ages 14 and over), led by the pastor, is offered each year for those young people contemplating full membership in the congregation. Also, a week-long Vacation Bible School is offered each summer. Our Adult Christian Education program offers various short-term electives (ranging from 3-8 weeks) throughout the academic year. Classes are led by Barry Baxter, occasional guest lecturers and missionaries as well as other qualified members of the congregation. YOUTH TO BE INSTRUCTED IN GODLINESS. The Lord enjoined His ancient people to exercise the greatest care that young people, even from infancy, be properly instructed. Moreover, He expressly commanded in His law that they should teach them, and that the mysteries of the Sacraments should be explained. Now since it is well known from the writings of the Evangelists and apostles that God has no less concern for the youth of His new people, when He openly testifies and says: “Let the children come to me; for to such belongs the kingdom of heaven” (Mark 10:14), the pastors of churches act most wisely when they early and carefully catechize the youth, laying the first grounds of faith, and faithfully teaching the rudiments of our religion by expounding the Ten Commandments, the Apostles’ Creed, the Lord’s Prayer, and the doctrine of the Sacraments, with other such principles and chief heads of our religion. Here let the Church show her faith and diligence in bringing the children to be catechized, desirous and glad to have her children well instructed.